As Amber refers to both the realm and capital city, so does Rebma. The name Rebma signifies a clear reflection of Amber. This used to be quite literal; the buildings and walls of Rebma were visually exactly the reverse of the buildings and walls in Amber, as if the builders had read their blueprints in a mirror. It had been a terrible inconvenience for Rebma city-dwellers, for if a house was knocked down in Amber, its companion in Rebma would also fall. No change could occur in Rebma unless it had been made in Amber first. To avoid peril, the citizens of the reflected city tended to dwell in older, established buildings in the Upper City that are unlikely to change, easily done since the population was a mere fraction of Amber's. Rebma's equivalent of the Lower City areas of Amber were therefore underpopulated, except for visitors, the destitute, conspirators, and criminals. The most stable area of the city was upon north face of the undersea mountain of Rivlok, the royal palace housing the functions of government and court. Far beneath the Palace is the Pattern Chamber of Rebma. Only a few have ever walked it, and most citizens of Rebma do not even know of its existence. Since the breaking of the Rebma Pattern several years ago, and consequent destruction of much of the city during the Cataclysm, the city has ceased to be a straight reflection. Not only has the city orientation somehow flipped to the southern side of Rivlok, but reconstruction of neighbourhoods has gone according to Rebman aesthetics and materials, and more importantly, has not showed signs of rolling back to former appearances. The greatest example of this extraordinary change is the then-Lord Regent's brainchild, an auger-inspired building called The Great Archives. Extending roughly a mile out around the sunken, fortified region from which the great capital of Rebma rises from its latest ruins at the southern foot of Rivlok, the enchanted area regulates atmospheric pressure, temperature, and of course, its air solubility within the lungs of topside visitors to the realm. Here, one may: Walk the sea floor at a dreamy pace or lift off and swim as desired; speak softly or loudly at a mere fraction of the typical distortion; and perhaps most importantly, wear the latest in scanty Rebman fashion without suffering unduly from cold exposure. This effectively means the conditions within this great zone of influence simulate the properties above sea level. Sword fights, running, horseback-riding, and thrown objects work as well as they need to. And yet, it is still water, and without taking necessary precautions, dry things will get thoroughly wet. Fish can swim in it, oblivious; in effect, anyone naturally inclined or practiced can do the same. That said, these conditions are so unlike the reality of water, the real Sea environment beyond the enchanted boundaries, residents of the capital are considered 'soft' by those living throughout the territory. The true nature of the Sea lies beyond the city, as do the best experiences, and the richest rewards. Rebma's domain begins not precisely at the tidal line, as that will vary over the course of a day, but just beyond the Shallows where ships would typically run aground. As this measurement is nebulous itself, the margin could be considered a neutral zone in times of political conflict. Where Rebma formally begins, it extends from the underside of the water line to the sea floor. No matter what the depth in feet, it is known as The Deep. Beneath the Waves. To Rebmans and the Deep Peoples, it's the Sea with a Capital S.
As a visual exercise, consider the Burj Khalifa in India, currently the tallest man-made structure in the world. It is 2722ft in height — which is around the minimum depth in most areas of Rebma Undersea. The Amber sun might illuminate that much at the height of day, though with diminishing effect until there is naught but a murk of barely discernible shapes beyond one's arm's length. Deeper than that is pitch blackness in all directions, without artificial aid or the presence of bio-luminescent flora or fauna. Critters are present at every depth, or sometimes not at all, leaving featureless expanses of barren ecology that are as dangerous in their own way. The characteristics of the Sea floor are endlessly varied, with wrecks, ruins, and wondrous phenomena as seen nowhere else except perhaps the crazy places in Deep Shadow. The Sea is cold and constantly moving, a weighty, distorting series of layered atmospheres from top to bottom. The gravitational pressure builds to incredible lung-crushing blood-toxic degrees by the time one reaches that minimum depth, unless proper gear or mystic precautions are in place. As hostile and unforgiving an environment as it can be to outsiders, it is a pleasant and protective world to the species and intelligent races who call the Sea their home. With a healthy amount of respect, and/or the invitation of a gifted denizen to experience the beauty of their world as they do, the Sea will embrace and protect even air-breathers for a time. Pressure is a natural phenomenon that exists in all environments with atmosphere. It is compounded underwater by the density of the water, so that air-breathing humans feel increasing levels of discomfort starting at upon diving past a certain depth unassisted, which will vary according to individual awesome and dramatic effect, but would average around -40 feet. -300ft with normal scuba gear. -1000ft taking extraordinary measures. Water-breathing sentient races are admirably adapted to the environment, and can descend much deeper than humans before feeling that discomfort from atmospheric pressure. This range can start at about -3500ft and reach a maximum of -6500ft to -8500ft unassisted, depending on the race and individual. As always, the actual limits are dictated by the laws of dramatic suspense and challenge. The magic of the Selkie's kiss, however, increases this range considerably, and grants the same pressure resistance as the individual administering it. The ill effects of atmospheric pressure to an otherwise healthy individual can be soft tissue damage, blood toxicity, and/or loss of consciousness. The effect of spending enough time, unprotected, in the overall chill environment of the open ocean, is a sapping of one's core body temperature. At critical levels, one is threatened with unconsciousness at best, and death by organ shutdown as the worst projection. As always, actual consequences for PCs shall be mitigated by their awesomenss and are negotiable for dramatic effect. The thematic upshot of these rough calculations is the creation of a forbidding and hostile zone in Rebma that not even the Sea's favoured individuals can go for more than a couple of minutes at a time. Even aquatic animals have species-specific limits to their depth survivability, although there are many creatures that inhabit the deepest of water by virtue of their specialized biology. These creatures comprise another type of lethal danger faced by those trying to explore the Deep, let alone the Abyss. The Sea guards its secrets well. For those who 'rise' to meet these formidable challenges, the rewards of discovery can be considerable. NOTE: Orange Arrows are only suggestions of surface current flow. 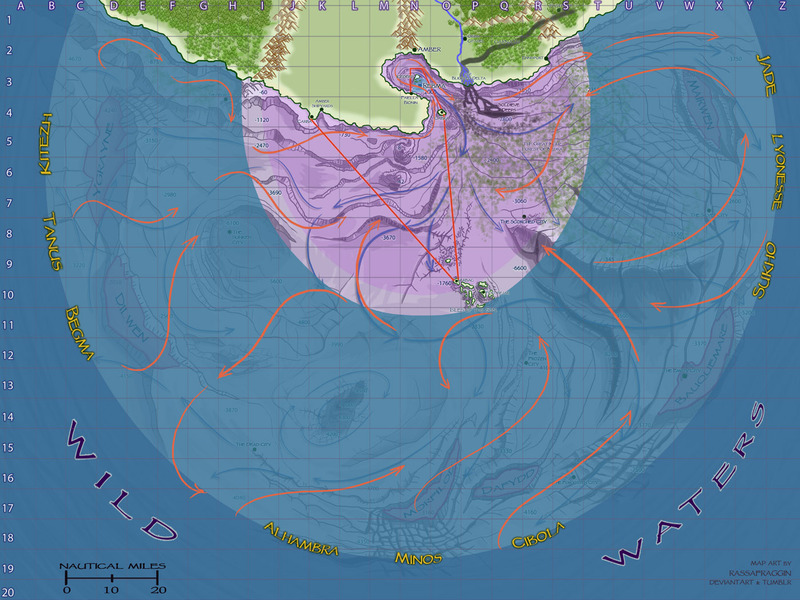 The blue arrows are the dedicated, river-like currents that exist at various depths. The violet circle represents the range of The Patterns' influence out to Sea, ie. where shadow manipulation may begin. The solid red lines mark the boundaries of Rebma's sovereign territory above the waves, a No-Sail Zone for unauthorized ships. The translucent blue layer is an obfuscating effect to represent the surface of the sea. The yellow text is the general location and alignment of the sea-bound Shadowpaths to Golden Circle destinations. As always, maps are a guideline, and distances, depths, and other details of what might be found in any area are subject to GM interpretation in any given plot. OOC/IC NOTE: The whole Undersea is a vast and unexplored wilderness even to many of the Rebmans and Aquatic Races who travel the most popular routes between the inhabited areas; to all non-Rebmans except the adventurers/scholars/mages often operating in friendship with the realm, the Undersea is an impenetrable mystery. While there may be maps in existence to be gained ICly that show the way to any given spot, they will NEVER be as detailed as this illustration. This means players may make use of this map as a visual aid for RP, but are expressly not cleared to add geographic details to their character's IC knowledge, without RP in Rebma to that effect, or extensive IC investment in Rebma, the equivalent of Lore GL-Rebma/6, 7, and 8, and Lore GL-Secrets as applicable.